OnLive wanted 1500 votes on their Sega classic games Week #2 Poll to release all games at once, but they didn't get even near that mark with 537 votes. Therefore OnLive will release this week's SEGA Genesis (Mega Drive) classic games in the order voted by gamers. The game with the most votes was Eternal Champions (165 votes), second was Sonic Spinball (138 votes) and third was Kid Chameleon (64 votes). The first two games made it to the OnLive PlayPack today. The PlayPack now stands at 167 games and counting. 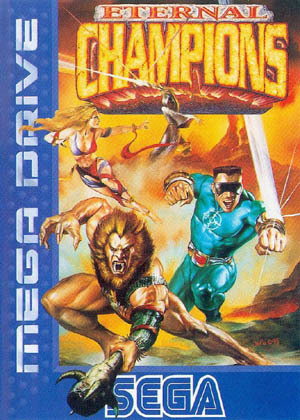 Eternal Champions is a 2D fighting game classic published and developed by SEGA. The game supports local multiplayer. Unjust deaths were dealt upon nine of history's greatest and most influential warriors, and the future now stands at the brink of chaos. You can play the free demo of Eternal Champions for the US powered by OnLive. You can play the free demo of Eternal Champions for the UK powered by OnLive. Sonic Spinball is an pinball video game classic published by SEGA and developed by the SEGA Technical Institute and Polygames. The term "Spinball" is a portmanteau on pinball and "spin dash", a move Sonic performs. Sonic Spinball is essentially a pinball simulation featuring Sonic as the "ball". The main difference from the traditional pinball game is the ability to influence Sonic's movement somewhat while moving, although flippers are still the primary source of movement. In a few rare instances, the player can control Sonic on foot, but for the majority of the time he is rolled into a ball controlled by the flippers. Sonic the Hedgehog and Miles "Tails" Prower fly onto the scene, but Sonic is knocked off the wings of Tails' airplane by a blast from the fortress. He falls into the water, but survives and ends up in the Veg-O-Fortress. Only Sonic can penetrate the Pinball Defense System to free the animals, retrieve the Chaos Emeralds, and put a stop to Dr. Eggman's fiendish plans! You can play the free demo of Sonic Spinball for the US powered by OnLive. You can play the free demo of Sonic Spinball for the UK powered by OnLive. Very interesting and informative article, thank you. I have read it with a great pleasure. In return I will be very glad to recommend you this helpful website with saga genesis emulator https://romsmania.com/emulators/sega-genesis thats works just amazing.